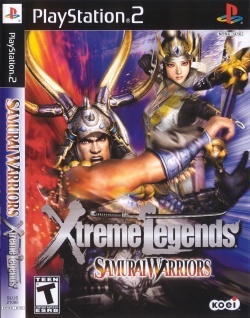 Game description: Xtreme Legends adds a host of new features to the original Samurai Warriors. Now you can play as one of four new warriors, each with a unique story with its own branches and multiple endings. Lead a campaign on the new Battlefield of Komaki-Nagakute while mastering new items and skills. Also new are VS mode stages, a Survival mode course, and difficulty levels. In addition to adding new features, Samurai Warriors: Xtreme Legends enhances existing features, such as the character growth system and artificial intelligence balance. Expansion to Samurai Warriors, it includes four new characters (Imagawa Yoshimoto, Hashiba Hideyoshi, Honda Tadakatsu and Inahime) and a brand new mission and map. This also offers new weapons, items, skills, three new versus modes, a new survival mode, and fixes several problems. A new difficulty level, Novice is also added which is easier than Easy and targeted for beginners. This page was last edited on 19 September 2016, at 19:12.